Beatrice has confirmed that she put up the second batch of air pollution monitoring tubes and the results should appear on the FoE national map. Richard reported on an experiment using a monitoring device for particulate air pollution (PM2.5) at rush hour and for people walking, cycling and using a car on the same route. The main aim is to raise awareness and ensure politicians will support policy to implement air quality zones locally. Individual packs have been sent to Shaun and Richard and group information is expected this week to support a media stunt and appropriate press releases etc. 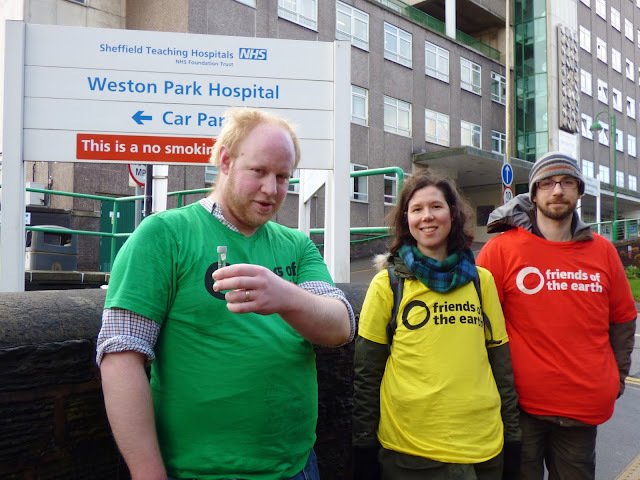 Richard and Shaun are available but we need more people to help out and Sheffield Climate Alliance can be asked at tomorrow’s meeting. There is a media training event the same day and that also might be an opportunity for a media stunt. The pack containing the FoE resources should arrive between Mon and Wed.
An email from Annie O’Gara raised the issue of air pollution near a proposed site for a school in S7 and she came to the meeting to explain the local concerns about the environmental impact from both increases in air pollution and from previous use as a landfill site. We agreed to keep in touch, particularly in relation to the air pollution campaign. Shaun has sent relevant information to Esther Knowles about the campaign as she expressed an interest in the campaign. If you'd like to get involved in the air pollution campaign then please get in touch.